The same software we use to visualise the Earth can be used to show the surfaces and atmospheres of other planets. Our software supports very large global terrain models, allowing us to show the 3D surface form of the Earth, Mars, Venus or any other solid planet or moon. 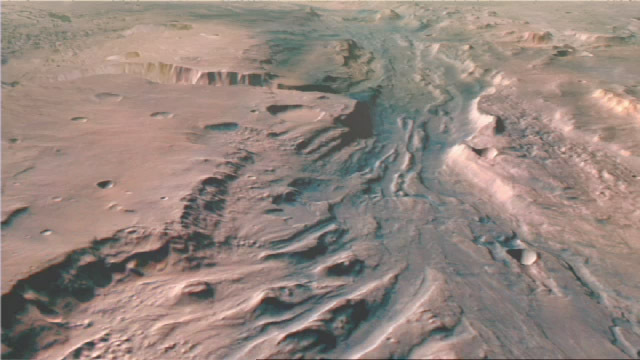 Where detailed local terrain data is available, such as for many parts of Mars, we can simulate views from near ground-level. As well as maintaining up-to-date texture maps of the planets and moons of the Solar System, we have developed detailed models of the ring structure of Saturn, Uranus and Jupiter based on original science data from deep space probe missions. Using our unique star renderer, we can ensure that our planetary sequences have accurate night sky backdrops. Ianis Vallis overflight based on ESA Mars Express imagery and derived terrain, for University College London and the Royal Society Summer Science Exhibition (HRSC data products © 2006 UCL/ESA/DLR/FUB (G Neukum)).